In machine vision, there is a clear trend towards greater resolutions, while image quality is increasingly growing in importance. Higher richness of detail is leading to increased detection reliability. Whereas many of the lenses used by industry feature a fixed aperture and focus, a powerful standard with controllable lenses has emerged in the consumer segment. Is it suitable for industrial use? Just under 10 years ago, Olympus and Panasonic unveiled the Micro Four Thirds (MFT) standard for mirrorless cameras. The standard defines the underlying conditions for building (consumer) camera systems with exchangeable lenses. The system has since been adopted by renowned optics producers such as Jos. Schneider, Carl Zeiss and Sigma. The image circle was fixed at 21.63 mm and the distance between the lens mount and the sensor substantially reduced in order to achieve compact (mirrorless) camera systems. The lens is controlled by actuators in the lens itself (each lens has its own processor) with 11 contacts on the inside of the lens mount. 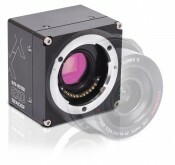 Producers of lens systems for machine vision are faced with large-format high-resolution sensors (e.g. Sony IMX304 with 1.1” and 12MP). New lenses come onto the market each month. However, resolutions of 12MP or higher are rare and expensive. Traditionally, resolution is measured by evaluating the modulation transfer function (MTF). However, a precise examination of machine vision lenses often reveals a substantial deterioration in imaging performance towards the edges. This factor is growing in relevance given the increasingly larger resolution (with smaller pixels) and the increased area of cameras. With its diagonal of 17.52 mm, the larger IMX304 still comfortably fits within the image circle of the MFT specification. Major optics producers supply excellent and very well documented MFT lenses with an outstanding MTF up to the edge of the image for these specifications. Aspherical lenses with low refractive glass are the standard here. CMOS sensors are growing in popularity, with the Sony IMX sensors in particular promising high quality. Nearly all CMOS sensors use microlenses to enhance light sensitivity and to improve area coverage. Here, each individual pixel has its own optical system. Ideally, the angle of incidence of the imaging beam should be perpendicular to the sensor plane for these microlenses. The larger the sensor diagonal, the more obliquely the rays reach the edges of the sensor in the case of conventional lenses. This leads to a loss of light or shading in the case of large sensors. Modern MFT lenses mostly have a telecentric design on the image side, thus ensuring uniform illumination across the entire sensor. Obviously, it is also possible to compensate for the radial shading in the camera but this means sacrificing the wide and expensive dynamic range. MFT lenses also have disadvantages. In many machine vision applications, the lens system is fixed permanently. After all, variable focus is a source of uncertainty. However, AF can frequently also be deactivated. Consumers do not always treat their equipment carefully. Thus, in non-representative tests lenses prove to be remarkably resilient and still operate perfectly even after a million focusing operations (see inVision 2/2014). This is attributable to modern magnetic bearings and tight volume-production tolerances. And there is a wide range available with focal lengths from 7 to 300 mm. 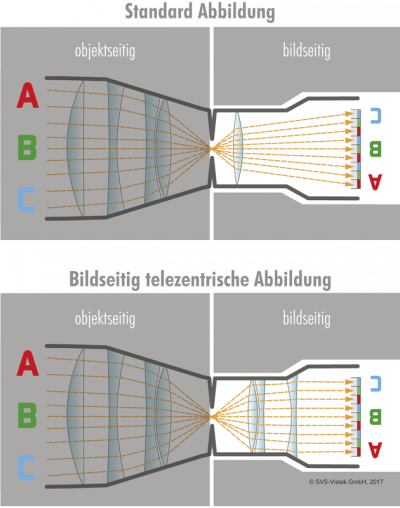 Modern MFT lens are mostly telecentric on the image side, thus achieving even illumination across the entire sensor. Machine vision is now leaving the preserve of plant engineering with its static imaging geometries. There is growing demand for new designs that can be implemented conveniently with controlled lenses (focus, zoom, iris) because the object distances are no longer static as on a conveyor belt but must be adjusted separately for each new object. Machine vision cameras such as the EXO304 Tracer with an MFT lens mount fit the bill with the new possibilities that they offer. Individually adjustable lens systems offer major advantages for “Industry 4.0” and “ batch size 1” production with collaborative robots. High-quality lens systems have never been cheap and are not likely to become so at any time in the future. Yet, volume production on a large (consumer) scale is resulting in high-quality MFT lenses offering extremely good value for money. In terms of quality, they are at least the equal of many industrial lens systems and available immediately. Machine vision is changing - both in terms of camera and lens technology and with respect to the requirements being made of it. Recent developments in camera sensors are an ideal match for the range of capabilities offered by Micro Four Thirds lenses. Focus, zoom and iris controlled by GenICam offer new possibilities for machine vision. It is up to us to make use of them. Cameras such as the SVS-Vistek EXO304 Tracer with MFT are already providing system integrators with new, reliable, high-quality and easy-to-integrate instruments. The EXO304 Tracer with an MFT bayonet offers new perspectives in machine vision thanks to the possibility of individually controlling focus, zoom and aperture.